We have been adopted and get to free-roam in our new home! We are a matching pair as we both have a white-tipped front paw. Nutmeg is special because he also has a white-tipped nose. We are smaller bunnies - not quite dwarfs, but smaller than your average rabbit. We were left in a night drop-off at the shelter, so the volunteers don't know our stories. Nutmeg is more adventurous and curious than me (Sprout), but seeing him have fun in the runs is making me join in. We much prefer playing on the floor with you, so I hope you will join us down here. Check out their other photos on their Petfinder page! 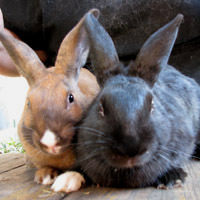 Nutmeg and Sprout are waiting for you at the Oakland Animal Shelter, so no need to email or anything if you want to meet them, just come on down and visit! You can find directions and hours on our website. The adoption fee for them together is $70 at Oakland Animal Shelter.